There are many ways you can get involved and help our students. Check out these opportunities! Empower local high school students for success by mentoring three to four students in our structured, evidence-based Workforce Prep program. Mentors are trained and provided in-class staff support at every mentoring session (one morning hour, one day per week, 20 weeks, October through May in Detroit, Harper Woods, Madison Heights, Pontiac, Warren, or Sterling Heights). Teach students about specific careers by hosting a 30-minute hands-on simulation activity that directly relates to a job that exists at your company (8-10 presentations for up to half a day in March). Learn more by contacting Kathy Morgan at Kathy@WinningFutures.org or 586-698-4387. Help us choose scholarship recipients by interviewing students who apply or judging their application essays. We routinely award up to $25,000 in annual scholarships and will use your feedback to help choose recipients (one time for two to three hours in February or March). This annual fundraiser attracts executives from the region to raise funds in support of our students. 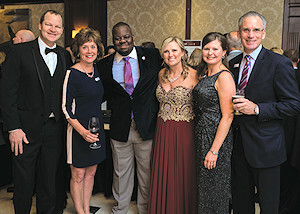 This specialty wine and gourmet food gala is held in February at The Townsend Hotel in Birmingham. Volunteers are needed to pour wine and help at registration. 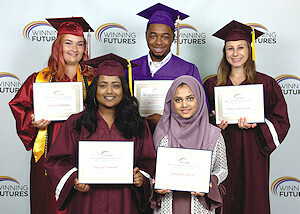 Learn more by contacting Kiana Elkinsat Kiana@WinningFutures.org or 586-698-4077. Help students refine their networking skills and learn about different career paths. You will talk one-on-one with students about your career path while asking them about their professional interests and goals (one time in the morning for one hour in September). Learn more by contacting Kathy Morgan Kathy@WinningFutures.org or 586-698-4387. Help students develop career plans by listening to their five-minute career presentation, asking questions, and coaching through constructive feedback (one time in the morning for two to three hours in May). If you are interested in any of these opportunities, please complete our Interest Form and we will be in touch about how to sign up.